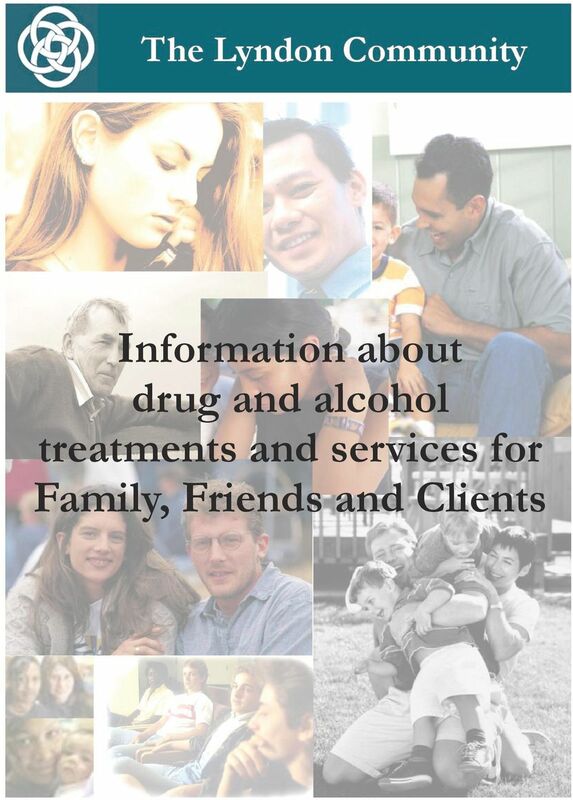 Download "Information about drug and alcohol treatments and services for Family, Friends and Clients"
3 Welcome to The Lyndon Community This booklet has been developed to inform family, friends and clients of The Lyndon Community about the programs offered. 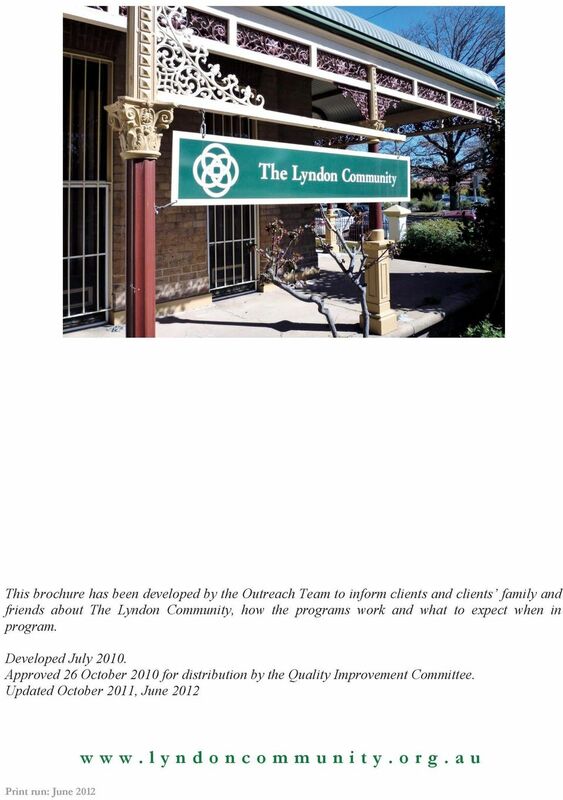 The Lyndon Community includes the Lyndon Withdrawal Unit, the Lyndon Therapeutic Community and the Lyndon Outreach Service. 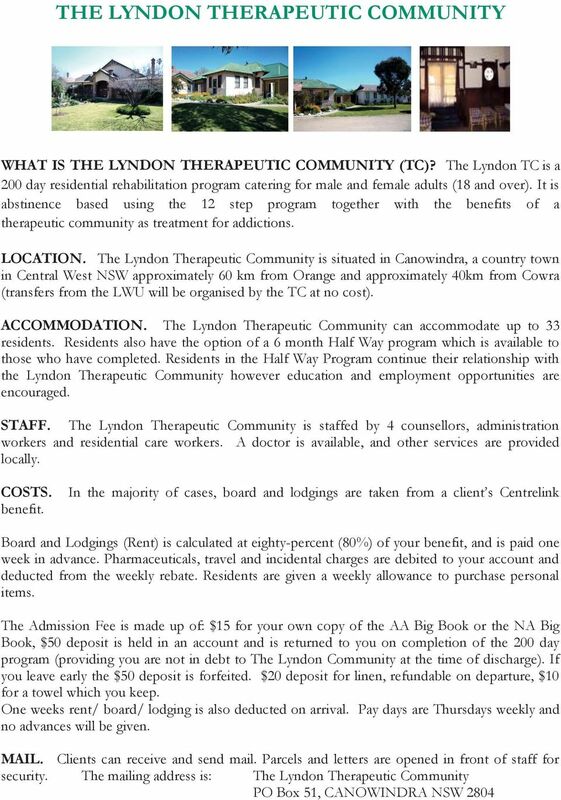 The brochure includes information about: Accommodation Costs Location Staff Mail Phone calls Visits and leave (where applicable) Tips for family members Useful contacts If you would like more information on The Lyndon Community, have a look at the user friendly website: or contact the appropriate Program Manager. All prospective clients must undertake a phone assessment prior to admission. Prospective clients can call (02) during business hours to be assessed. 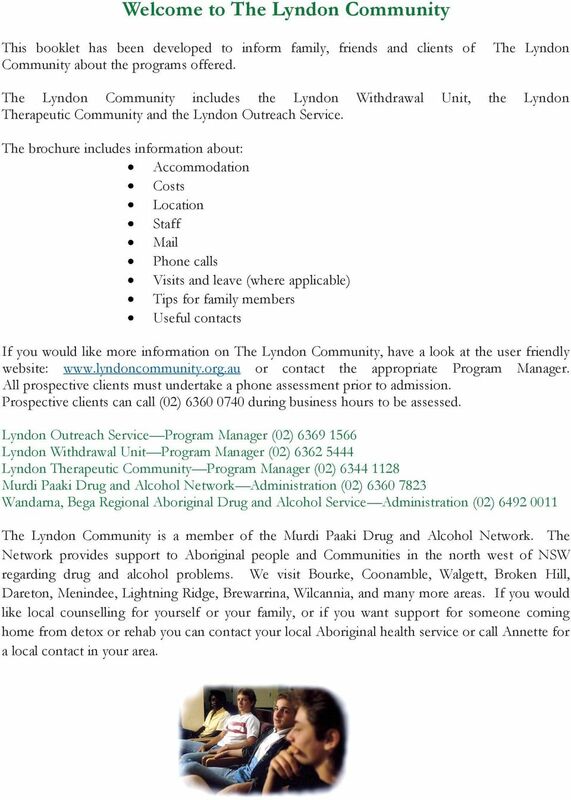 Lyndon Outreach Service Program Manager (02) Lyndon Withdrawal Unit Program Manager (02) Lyndon Therapeutic Community Program Manager (02) Murdi Paaki Drug and Alcohol Network Administration (02) Wandarna, Bega Regional Aboriginal Drug and Alcohol Service Administration (02) The Lyndon Community is a member of the Murdi Paaki Drug and Alcohol Network. The Network provides support to Aboriginal people and Communities in the north west of NSW regarding drug and alcohol problems. We visit Bourke, Coonamble, Walgett, Broken Hill, Dareton, Menindee, Lightning Ridge, Brewarrina, Wilcannia, and many more areas. 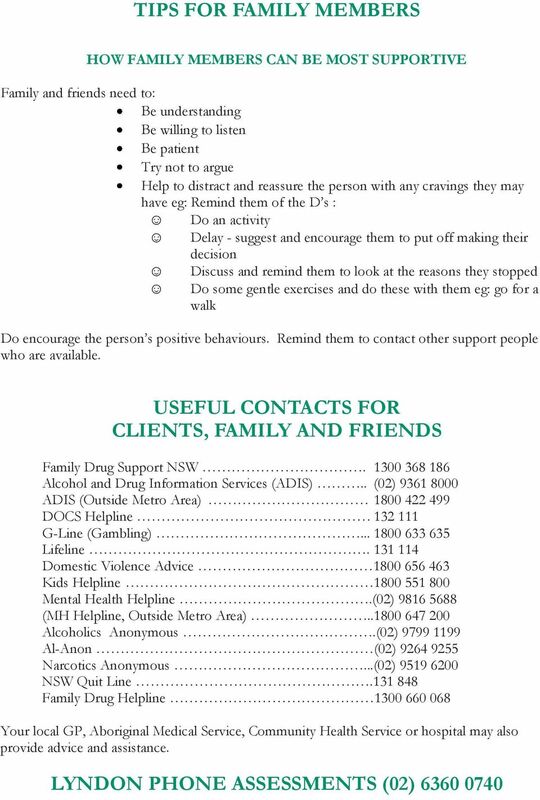 If you would like local counselling for yourself or your family, or if you want support for someone coming home from detox or rehab you can contact your local Aboriginal health service or call Annette for a local contact in your area. 7 INITIAL RESTRICTIONS. New residents are not permitted to leave the grounds of the TC for the first 14 days unless staff permission has been given. 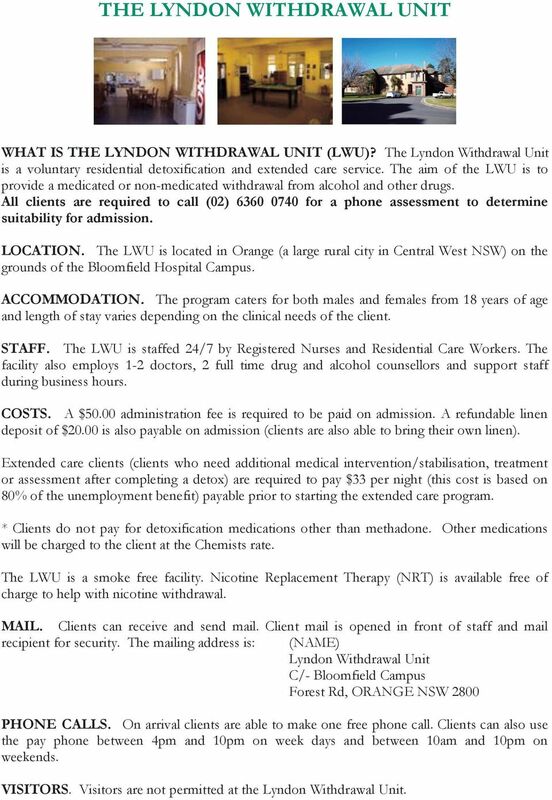 Residents will be seen by the local GP for routine admission checks and to meet Centrelink requirements. During this period residents will not be able to make or receive phone calls. If an urgent call is required it must be discussed with the staff member on duty. No visits will be allowed during this time. The third and fourth weeks after arrival, residents will be allowed to go out, at the discretion of staff, and only with a responsible resident in attendance. The responsible resident is ONLY responsible for taking residents to appointments and getting essential items such as toiletries. PHONE CALLS. A pay phone is available for resident use after 3.00pm Monday to Saturday and after 12.00pm Sunday until 10.00pm. LEAVE. 5 DAY LEAVE (MON-FRI) Residents become eligible for 5 days leave upon the completion of 90 Days in the program. This is approved by counselling staff. Earliest departure Monday 6am and latest return Friday 9pm. All legal matters should be attended to before entering the program. If legal matters are unavoidable and require your appearance in this period ALL leave is forfeited if an overnight stay is required. 7 DAY LEAVE Residents become eligible for a 7 day leave at the completion of 140 days in program. This is approved by counselling staff. Earliest departure 6am and latest return 9pm. Any leave after this is at Staff discretion. NOTE: A leave application must be submitted. All leave must be approved by Counsellors. Breathalyser and urinalysis will be taken upon return. VISITS. After 4 weeks residents may apply to have visitors. Visitors must sign the visitor s book on arrival and departure, in compliance with fire and safety requirements. They are also subject to the rules of The Lyndon Community. 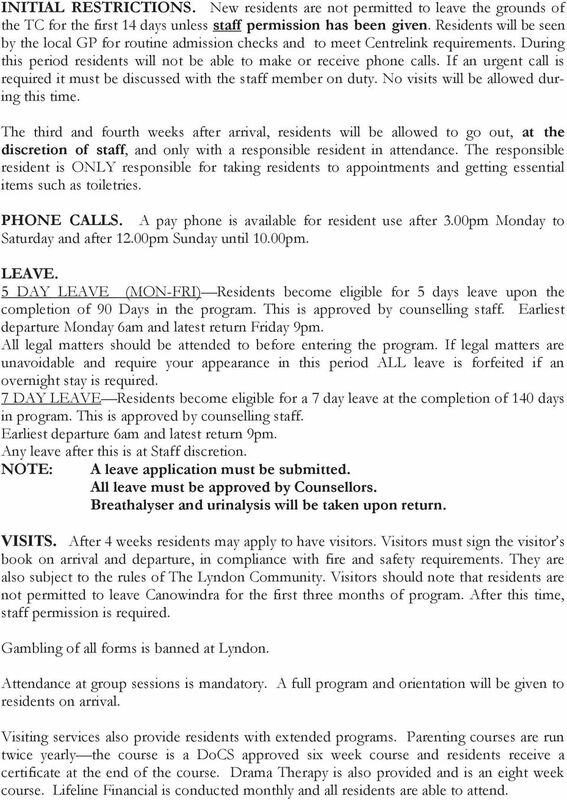 Visitors should note that residents are not permitted to leave Canowindra for the first three months of program. After this time, staff permission is required. Gambling of all forms is banned at Lyndon. Attendance at group sessions is mandatory. A full program and orientation will be given to residents on arrival. 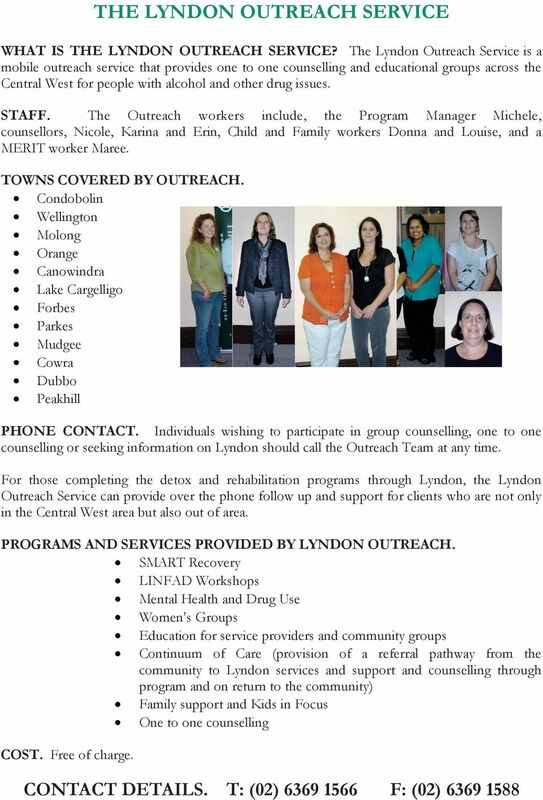 Visiting services also provide residents with extended programs. Parenting courses are run twice yearly the course is a DoCS approved six week course and residents receive a certificate at the end of the course. Drama Therapy is also provided and is an eight week course. Lifeline Financial is conducted monthly and all residents are able to attend. Timatanga Hou New Beginnings: Detoxification Service. LA HACIENDA TREATMENT CENTER Family Program Information Included in this information package: Description of Family Program Transportation & Lodging Family Program Schedule La Hacienda Family Program R.S.V.P. We are seeking someone with a vision to play a key full time role in the organisation as the Project Manager for the duration of the pilot project. Thank you for your enquiry, and intention to attend this year s retreat with Subhana and Carol.